A practical and extremely affordable little package for practice and computer recording. Sounds. Intuitive software. Phrase training. Flimsy knobs. Display codes not clear. Zoom's G1u, packs a load of features for not a lot of money. It's an amp modeller/multi-FX unit that's also a USB audio interface. It features an onboard tuner, a footswitchable five-second looper and a bunch of drum rhythms to play to, plus it comes with ZFX Tools editing/phrase training software and the Ableton Lite 7 music production software - all for just £99. Powered by batteries or the included power adaptor, the G1u's body is tough plastic, as are the footswitches - they feel solid enough, but you wouldn't want to jump on them on stage. The unit is probably more at home on a tabletop - those switches are easily operable by hand to navigate the 100 factory preset, and 100 user patches for storing your own edited sounds. Each patch is built from a chain of eight modules made up of 67 effects, amp models and cabinets. There are modules for compression/special effects, drive (amp type or stompbox), EQ, ZNR noise reduction, amp cabinet type, modulation, delay and reverb. You can choose the effect type for each module and edit up to two parameters using a rotary switch and knob - the information being shown as a combination of letters and numbers in the double-digit display. You'll have to refer to the manual until you know what each stands for. There's provision to connect a footswitch for bank changing or drum tap tempo, or an expression pedal to control wah or volume. Plus, as a USB interface, the G1u provides two channels in and out of the computer. Once connected via USB you also get access to the ZFX Tools software. The actual sounds in the G1u cover a massive variety of musical styles and are all very usable - connect a pair of headphones, plug in your guitar and you'll be surprised at how this little box will encourage you to play. While the modelled amp sounds may not stand close scrutiny next to a real valve amp and an expensive array of stompboxes, they're just fine and dandy for practice, and can bed in nicely to recordings. 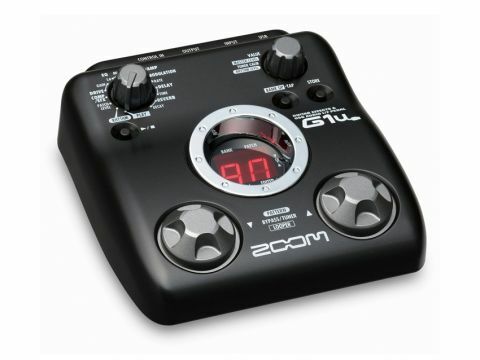 Zoom has included patches with some very familiar tones from well-known artists, as well as ones that feature just a single named amp or effect. It's not just bog-standard stuff either, with effects such as a harmonised pitch shifter and up to five seconds of delay. The 40 onboard drum rhythms with adjustable tempo should give you plenty to play along with, but if you connect to a computer and use ZFX Tools you also get access to a virtual drummer and bassist playing in a bunch of styles in whatever key you specify. The software also enables you to record and loop your own playing and import .wav files of music that you want to learn - with half-speed playback also possible. ZFX Tools' mouse-driven GUI for editing the G1u sounds is very intuitive and easier than doing it with the unit's knobs. It also offers a comprehensive library facility, which features new patches for you to download - all patches in the library are instantly accessible with a mouse click. As an audio interface, the G1u has direct monitoring capability, eliminating any latency problems and enabling you to record the exact sound you've dialled up on it directly to your computer. The G1u is packed with features. It's ideal for headphone use or simply plugging into your amp. But connect it to a computer and get the software running, and you're getting a powerful package that enables comprehensive practising and learning opportunities, as well as computer recording. For under £100, there's very little to find fault with here.